The idea of a Chinese human exploration mission to the Moon has long appeared in the media and is to a large extent expected to take place in the future by the global space community. Such a venture is unlikely, however, to be a repeat of the Apollo ‘flags and footprints’ approach to lunar exploration and will take a long-term approach. One hint of this can be seen in a comprehensive conceptual design for a human lunar base being studied by researchers and scientists at the China Academy of Space Technology (CAST), an institute under CASC, the main contractor for the Chinese space programme. Professor Guo Linli of CAST’s Institute of Manned Space System Engineering gave a presentation on the base at the Global Space Exploration Conference (GLEX) in Beijing in June, which details a design to allow long-term human stays on the Moon, with the goals of scientific research, technical experiments and resource utilisation. While far from being an official plan, the concept looks at possible motives and required research, systems and technologies, and could form the basis for, or influence, a future concrete human lunar project. Guo’s talk was based on a multi-author paper which focuses on the habitat for the base, and compares and analyses three types of habitat configurations. The paper opts for an integrated approach, using rigid modules for the interior and a constructed structure created by 3D printing for the exterior, as a later stage, as illustrated in the main image above. The interior main body of the integrated human lunar base consists of a habitation module, laboratory module and support module, connected by expandable joint structures but separate and somewhat independent of each other, for reasons of psychological needs and personal health. The living area module would contain the kitchen, gym, toilet and necessary facilities, with the communication system, main computer, central control and backup systems located in the support module. Also detailed are considerations for emergency situations, with each habitat having three exits, including one to a pressurised rover which can deliver astronauts to a launch/landing area. Water supplies could double up as a protective layer in the walls of the habitats to provide protection against radiation. The main specifications state that the base would have a design lifetime of at least 8 years, be capable of hosting 3-6 astronauts at a time for periods of 3 months or greater at a time, and be able to run automatically without human presence. Guo’s presentation also outlines the communications, energy, in-situ resource utilisation, thermal control, life support and emergency systems and resources required for long-term habitability. Most important are oxygen, water, food, energy and construction materials. Biological regenerative systems would include microbial waste treatment technology, plant cultivation, animal (insects such as silkworm and mealworm) and algae production. Power sources, in addition to using solar arrays, will include nuclear power and a regenerative fuel cell, with excess energy going towards electrolysing water to obtain hydrogen and oxygen. A constellation of circumlunar and polar orbit satellites would provide communications, navigation services and wide area network access for spacecraft, rovers and the lunar base. The paper uses Sinus Iridum as the site for the base, but Marius Hills and Cabeus crater are cited as excellent candidates. Final site selection would involve analysing the landform and physiognomy, accessibility, thermal environment, sunlight conditions, protection from micro meteoroids and potential for utilisation of in-situ resources. A massive project such as this is a long way off, but a possible path towards it can be traced. The first step will be Chang’e-5 (delayed until late 2018 or 2019), China’s first lunar sample return mission and also the world’s first since the Soviet Union’s Luna 24 in 1976. Professor Guo told gbtimes.com that, “After Chang’e-5 China will have lunar soil samples. I want to carry out research into how to generate oxygen from this lunar soil,” with possible water sources also being of great interest. This mission will be followed by further robotic lunar missions, including another sample return, possibly to the far side (Chang’e-6), and newly proposed missions to the lunar poles in the early 2020s which are slated for technology demonstration and in-situ resource utilisation tests. China’s main human spaceflight project is the Chinese Space Station (CSS), which will keep the country busy in low Earth orbit for around a decade after its completion in the early 2020s. However, construction of the CSS will bring valuable expertise and lessons, as well as experience in long-term stays in space, regenerative life support and other areas. But getting to the Moon is currently not possible. Guo notes also that China’s launch vehicles are currently not sufficient for human lunar missions. A variant of the Long March 5 can be used for launching CSS modules and an under-development next generation, deep space version of the Shenzhou crewed spacecraft, but a gigantic new, Saturn V-class rocket will be required for a lunar base project. Named Long March 9, it is in the early phases of development and CASC aims to have it fly before the end of the 2020s. If that holds, the super heavy lift launcher could facilitate a lunar base project in the 2030s. 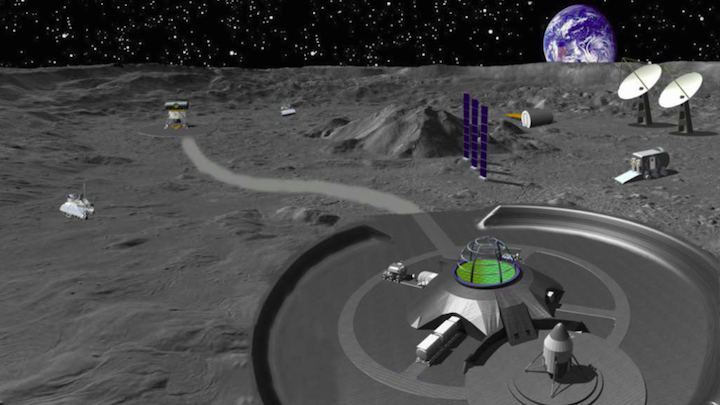 Before then, through investigation and research, Guo – who also instructs university students on lunar base design – and her team will aim to identify scientific goals of a human lunar base and determine the available lunar in-situ resources, and from there develop the necessary scientific experiments and technology. For operations on the Moon, required research includes evaluating lunar soil as a building material. Possibly of great help is that the European Space Agency, which has designated China a strategic partner, is already testing 3D printing methods with simulated lunar material. Ms Guo noted in conclusion to her presentation that the construction cycle and cost will require a wide range of international cooperation partners and commercial operations to get such a project off the ground and onto the lunar soil. The paper begins its introduction with the Russian astronautics pioneer and formulator of the rocket equation, Konstantin Tsiolkovsky: “The earth is the cradle of humanity, but one can’t stay in the cradle forever,” before positing that humans never stop exploring, citing Columbus and Gagarin. Currently, the European Space Agency, with the Moon Village concept, Russia, and the United States, with the Deep Space Gateway proposal and a recent new US space policy directive, agree that the Moon is the place to be.